The Long Foundation provides both strategic grants focused on achieving a defined impact, and responsive grants aimed at meeting Northern California and Hawaii community needs for qualified healthcare, education, and conservation not-for-profits. Within their conservation work, the Foundation funds efforts in habitat preservation, access to public lands, environmental education, and scientific research. 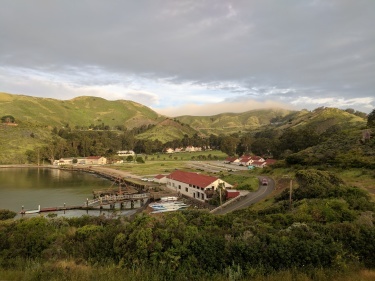 Similarly, the Institute aims to bring groups to Cavallo Point for environmentally-focused sessions that are action-oriented, represent diverse perspectives and sectors, have a local, regional, national, or international impact, and that spur commitment leading to clear outcomes. Every November through April, groups find inspiration in the national park lands, the San Francisco Bay, and historic Fort Baker through the Institute rate. We help provide an affordable means for organizations to tap the beautiful surroundings while discussing their plans, goals, and impact on the environmental arena. If your non-profit or government group is planning a meeting around environmental, conservation, or sustainability issues, consider joining the Institute at Cavallo Point. Discounted rates run from November through April every year and applications are accepted year-round. We hope to see you there soon.